…Anyone know of a reputable importer? This looks like the ideal little PMP, Surfing device to me, plus you get to play with Ubuntu. Throw some 3g card in there, and i am ready to buy :) (also at a higher price). Would be interresting to know if you can swap the wifi for 3g. i think ill wait for the next nokia maemo device! If this can run Elisa, it will be the best PMP on the market. I would like to see a GPS integrated, I don’t need 3G. AFAIK Ubuntu is working together with ARM to bring a version targeted at MID. It should be available in April. So I believe it will be usable quite nicely. Chippy do you have information when (if) the next nokia maemo device will appear? I really want a low power MID, that just do 3g and some kind of remote desktop. Hope this one will be available in Europe – at least through some importer. If it stays below 200â‚¬ I`m totally going to get one. Otherwise I will just wait for the next nokia internet tablet. I wouldn’t say so. There is plenty of front-ends available to make the Ubuntu interface touchscreen-friendly. So I’d bet that at least one of these front-ends would be installed by default on the retail version… It would be stupid of them not to do so — all the work is already done, it’s just a matter of installing additionnal packages to the OS. This kind of device can sell like hot cakes with such a low price! I guess telecoms could even easily subsidize completely such a device if it had 3G. I heard that this device will be using a Samsung (ARM 11) Sc6410 CPU as used in the Meizu M8 from the same family of CPU’s that powers the Iphone. It will run Ubuntu and LXDE lightweight desktop environment. I know of a number of reputable importers if anyone needs. I heard battery life will be strong (no numbers yet though) and it can be tethered to a mobile 3G modem via bluetooth 2.0. China price will be 899RMB ($132) but expected to rise onece exported. SmartQ will also be providing some kind of free application resource on their site too as I believe not all applications currently available for Ubuntu are suitable for embedded hardware. Obviously this will not be a particlarly powerful but as people have mentioned should make a nice PMP/ebook reader and light browsing device, plus you will also be able to take advantage of a whole host of apps. And I have to agree at this price tag it seems like a very attractive proposition. I just called a shop here in Beijing that advertised it. It will be available at the end of this month, apparently. 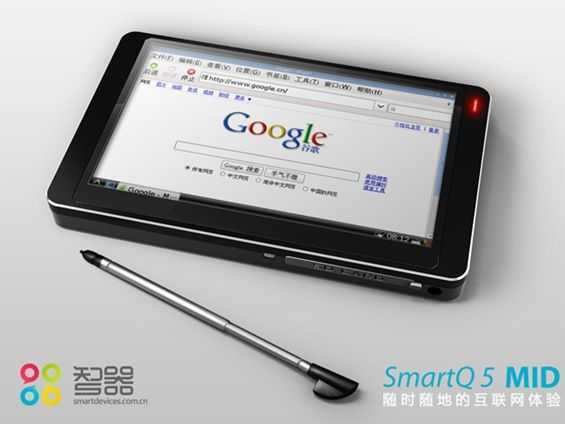 If Google were smart, they would be making something like this with Android on it. Never mind the 3G, wifi would be sufficient. They are off to such a slow start with carriers, this would be a better strategy. It’s really amazing! I’m waiting for it. This is what I waited for a long time, all what I need whit a low price, it’s perfect whit a 8+GB SD card. Sere83 or someone else knows a importer? i live in Colombia. i’m running android on mine. got it when it was released.